Players start in a 1-4 formation on the free throw line. We start with the bigs inside and the quicks on the wings. 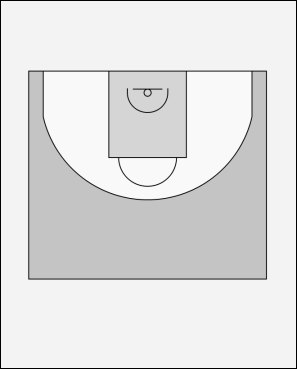 On the "trigger", the 2 wings make a hard flash cut to the basket - this cut needs to be aggressive with players ready to catch and make a quick shot. If these passes are denied, 1 and 2 set an up screen for 4 and 5 to cut to the ball. These cutters need to be ready to catch and shoot. After setting the up-screen, 2 continues high looking for a 3 point shot, 1 cuts to the wing looking for the pass and post feed into 5.